Zhang Liyin (born February 28, 1989), better known in South Korea as Jang Ri-in, is the first (and currently the only) Chinese solo singer to break into the South Korean music industry. Subject to much publicity, Zhang has been nicknamed the "Chinese BoA" and the next leader of the Korean wave. She speaks both Mandarin, which is her first language, and moderate Korean, and has released singles in both Korea and China, singing in both languages. Zhang was born in Sichuan, China as a native from Chengdu. Her parents, both are ethnic Yi, took her to their classical concerts and exposed her to a variety of music. At three years old, she began to learn the violin. Zhang was so accustomed to classical, American, and European pop music that she claims she never sang children's songs when she was a child. She also developed the ability to sing a song after hearing it only once. When she was nine years old, she showed her musical ability when she sang Celine Dion's "My Heart Will Go On". As she grew older, Zhang became more absorbed into pop music than classical music. She secretly listened to pop music because her parents were against it. When she was twelve, she was accepted into a middle school affiliated to Sichuan Conservatory of Music after scoring the highest with her violin talents, but she opted to become a singer instead. Eventually, her parents began to support her dream to become a singer and she gained confidence when she was selected as the top 10 adult singers in a national singing competition under the sponsorship of Shanghai. Zhang was discovered after Beijing partners informed the head of South Korean talent agency SM Entertainment of a young talent. In 2003, she moved to South Korea and started training at the age of fourteen. She received two years of special singing and dance training under SM Entertainment. Under the direction from producer Lee Soo Man, Zhang discovered her R&B voice. Zhang's debut was anticipated not only in South Korea, but all of Asia, due to SM Entertainment's advertising of her being the "Chinese BoA" as well as Lee Soo Man himself stating he was training her to be the next leader of the Korean wave. Before her official debut, it was already known that her first song was a duet with popular TVXQ member Xiah, which generated even more interest in her. Before the official release of her single, "Timeless" was available for free download between August 31 and September 6 on her official website. "Timeless" is a South Korean cover of the original single by Kelly Clarkson. On September 8, 2006, "Timeless" was released. She made her stage debut on MBC's Music Core on September 9, 2006 singing "Timeless" with Xiah. The first day Zhang debuted she was ranked #2 on the famous Korean music website, Melon; the following day she topped this chart and held her place respectively for two full weeks. The same day she also ranked #2 on the online charts of SBS's Popular Songs, just after popular boy band, Shinhwa's "Throw My Fist". "Timeless" was also placed first on Daum's Music Video chart as well as hitting the highest search number on the famous search engine, Naver. The "Timeless" music video, which is a two-part installment starring Lee Yeonhee and Super Junior members Han Geng and Siwon, was ranked #1 on Melon's Video Chart for four full weeks. Within ten days of debuting, Zhang entered the "Take 7" chart on SBS's Popular Songs (complied from internet and industry statistics). Zhang promoted the second track of her debut single, "Y (Why...)," in early 2007. SM Entertainment also released a "Timeless" documentary version of her "Y (Why...)" music video. This music video reveals her hardships during training; it also showed many behind the scenes clips of her promotion of "Timeless", including never-before-seen footage of her with Xiah. However, promotions for "Y (Why...)" ended quickly, and SM Entertainment announced that she would be on hiatus from the music industry throughout the rest of the year to prepare for her major debut in China in the end of the year. Zhang made a surprising guest appearance at TVXQ's second Asia tour concert in Seoul on February 23, 2007. She performed "TRI-ANGLE" with TVXQ, singing a part in the song that was previously performed by BoA. She made a second appearance with TVXQ on November 24, 2007 in Malaysia for the same concert, and was TVXQ's regular guest star for their "O" Asia tour until its finale in June 2008. Zhang's first Mandarin album, I Will was originally announced to be released in late 2007, but the release date was pushed to early March 2008. The album was finally released in different regions of China starting March 3, 2008 and on March 28, 2008, I Will made its Asia-wide release. Before the release of the album, two music videos were released on February 27, 2008 to promote the album. Similar to "Timeless", the two music videos "I Will" and "The Left Shore of Happiness", are one story but separated to two parts. Han Geng, Siwon, and Lee Yeonhee are also the cast for those two music videos. After the album's release, Zhang received praise from various industry professionals. Golden Melody Award-winning Taiwanese-American singer-songwriter Leehom Wang complimented Zhang's singing and was surprised to hear such a strong voice coming from only a nineteen-year-old. During a radio broadcast, award-winning Hong Kong-based singer-songwriter, Hins Cheung compared her "soulful" vocals to well-known R&B vocalists such as Whitney Houston, Leona Lewis and Christina Aguilera. He was impressed at the "international-level music" of the release and said he felt there was a lot of "power in this nineteen-year-old." On May 25, 2008, Zhang received her first award, following the release of her Chinese album, at the 5th Annual Music King Global Chinese Ultimate Song Chart Awards for Female Mainland Newcomer with Most Potential. In her speech, she expressed wishes for more financial support towards the Sichuan earthquake that had devastated home province two weeks earlier. Throughout the months of May and June, Zhang attended many online interviews and made numerous variety show appearances, as well as a short university tour to raise money for the Sichuan earthquake. A solo fan meeting for Zhang Liyin was held on July 5, 2008 in Beijing. Besides performing songs from I Will, she also covered songs from notable R&B female singers Whitney Houston and Christina Aguilera. 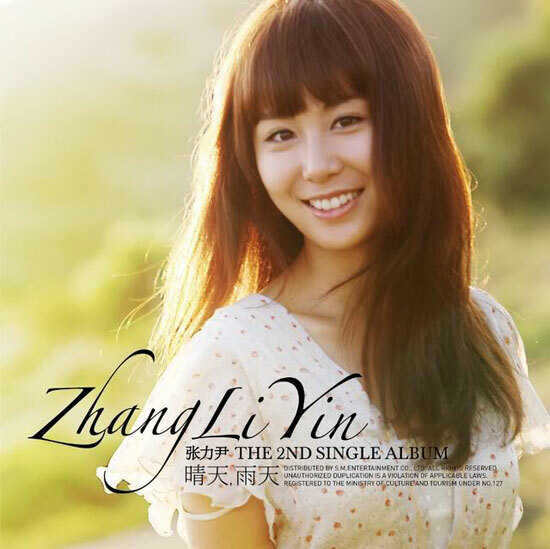 On September 13, 2008, fans first heard confirmed news of Zhang's repackage album, which would feature the track "Believe in Love", as well as plans for her second Chinese album. Despite this, the repackage album still has not been released and there has been no other announcements of it being sold in the future. While Korea's M.NET/MK Music Festival was being held on the same night, Zhang Liyin attended the 6th Annual Southeast Music Ranking on November 15, 2008, winning the award for Best Mainland Newcomer. Her win was followed by numerous invitations to other award shows throughout the month of December, including the 2008 Starlight Grand Ceremony, BQ 2008 Celebrity Ranking, and the 1st Annual Mengniu New Music Festival. The beginning of 2009 saw Zhang's Chinese activities come to an end as she started preparations for her second album. Activities for Chinese New Year brought her alongside Super Junior-M to many activities, including her first appearance on China's biggest television broadcaster, CCTV, for the Dance & Music Spring Festival Gala. She was also in Shanghai on January 9 to film for a song collaboration between many popular Chinese pop artists, such as Show Luo, Fish Leong and BoBo. On February 6, 2009, Zhang flew to Thailand for the second time in her career to attend the Bangkok concert stop in the SMTown Live '08 tour. For that weekend, her activity schedule was tight as she was required to fly throughout Asia for activities. Less than 10 hours after the end of the Bangkok concert, Zhang flew with members of SJM to Guangzhou, China to participate in the 8th Annual Future Star Competition, which also featured JJ Lin, Eric Tsang and Dicky Cheung. She returned to South Korea for album preparations on February 9, 2009. Aside from a performance at the Descendants of the Dragon concert hosted by Jackie Chan, Zhang was relatively inactive as she remained in Korea to record her second single. Finally, a year and a half after the release of her first album, a teaser for her upcoming song, "Moving On" was released on October 15. Four days later, the full music video was released through SM Entertainment and Sohu. The music video features Liyin reflecting back on her memories of the relationship between Donghae (of Super Junior) and herself before they break up. Despite fans' general disappointment towards the music video being only a slideshow of photos, it was highly anticipated. On October 23, a week before the single's release across China, a joint press conference was held for both Liyin and SJM for them to officially announce their new releases to the Chinese media. After three short months of promotions for "Moving On", Zhang announced on her Cyworld that she would be returning to Korea on January 24 to prepare for her second Chinese album. Like label mate Han Geng, Zhang holds an E-6 (Entertainment industry) passport, for foreigners in South Korea. Foreign artists carrying out promotional activities have limitations in terms of location and other factors. Han's passport only allows him to work under SBS and KBS, while Zhang's allows her to work only with SBS and MBC, which is why she only performs on the two stages. On August 1, 2008, the Korean government's law of restrictions on foreigners were lifted, and foreign entertainers in Korea are now allowed to perform in every station. However, Zhang was unable to perform on MBC due to the channel's conflict with her SM Entertainment. As of late 2008, MBC has removed the ban of SM Entertainment's artists on their channel. * Rookie of the Month, Digital Music Award: "Timeless"
* Best New Solo Artist, M.NET/KM Music Festival: "Timeless"